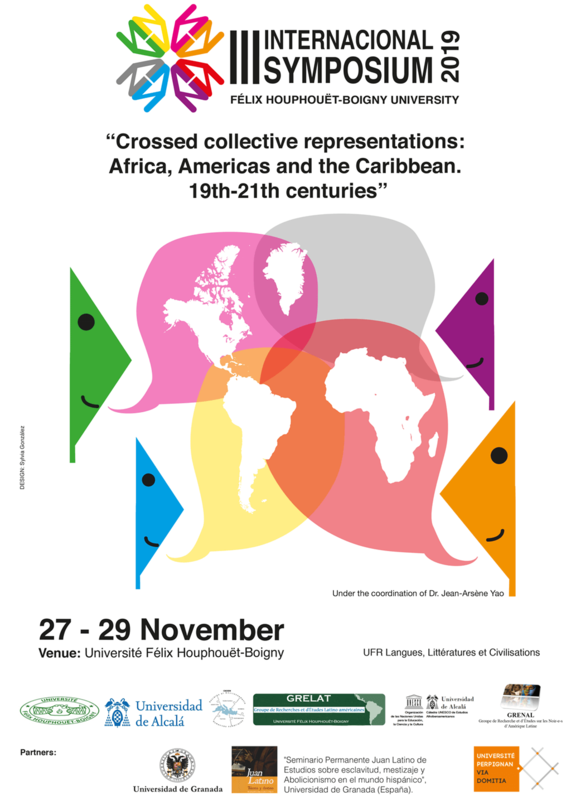 Organized by the Latin American Research and Studies Group (GRELAT) of Félix Houphouët- Boigny University (Ivory Coast), in collaboration with the Cátedra Unesco de Estudios Afroiberoamericanos of Alcalá University (Spain); the Latin American Research and Study Group on Blacks (GRENAL-Axis Languages and Identities/CRESEM) of Perpignan University (France) and the Seminario Permanente Juan Latino de Estudios sobre esclavitud, mestizaje y Abolicionismo en el mundo hispánico of Grenade University (Spain). In 1992, the commemoration of the 500th anniversary of the so-called “meeting of two worlds” gave place to several important meetings aiming at shedding light on the many relations between Africas and Americas. Addressing specifically these links, Professor Kifle Selassie Beseat pointed out that one of the great goal of the commemoration of the meeting between these two continents—one unknown to the other before 1492— is “the desire to learn and understand each other freely and reciprocally. One on the plurality of the roots of the Self and the rewarding and oftentimes polarizing multiplicity of the sources of the Other” (Africa-America Symposium: Afrique-Amérique: Rencontre ancestrale, Caracas-Venezuela, 1-5 février 1993). This encounter has also enabled people of African descent—in other words “the African Diaspora”—to recognize Africa as the cradle of their ancestors and to build a body of opinions, information, values and beliefs as part of the process of their national and ethnic identity-building. This “object-group” relation constitutes the central axis of the reflection that we wish to carry out according to the principle in which “social representation is thus always representation of something (the object) and of someone (the subject)” (Denise Jodelet, Les représentations sociales, 1989). Based on historical and historiographical knowledge, it is fair to say that African descents’ plural view of Africa reflects this type of relationship within its contradictory and conflictual sociopolitical and imagining positions. These positions—which should be fully considered—can give rise to collective myths, sometimes mobilizing or even subverting a sociopolitical order often established on the basis of a eurocentrism (Americas-Caribbean) when they are crystallized in the social imaginary. They can also lead to contradictory positions and confrontations among Africans or African descents. Thus, whether in Africa or in its Diaspora, Africa fundamentally symbolizes, as Valentin Mudimbe would say, a “conflicting object”. On the ground of the aforementioned, this Colloquium proposes to reflect on the productive tensions that characterize the unifying and dividing relations of Africas, Americas and the Caribbean. That reflection doesn’t have to be necessarily undertaken from a chronological perspective, but we encourage transdisciplinary approaches. The objective is to participate actively in the various institutional initiatives (UN, AU, UNESCO, etc. ), academics and citizens (NGOs, Cultural and Political Movements) in order to establish and strengthen a renewed dialogue on this subject. The Colloquium is destined to Researchers, Professors, PhD candidates and to Collectives opened to dialogue. 1-History and memoirs: Chronicles, historical stories, micro-stories, local stories, maroons people, anti-colonial and anti-slavery memories, Pan-Africanism(s), women’s struggles. 2-Languages and Literatures: Negritude in the Americas, symbolic Africa in Americas and the Caribbean (literatures, music, theaters, cinemas, etc. ), symbolic Americas / Caribbean in Africa, especially in African literatures (1980s). 3- Representations of Africa in Museums: Museums, places of memory, stories of American and African experiences. 4-Imagined identities: Speech, racial and sexual imaginary, aesthetic representations, dis/continuities between identities and territories, identities in plural contexts, African Diaspora(s). 5-Ubuntu: Current state of university agreements, economic relations, transfer of cultures (music, paintings, religions, cinemas, citizenships) and policies in Africa / Americas / Caribbean. Languages of the Symposium: French, Spanish, Portuguese and English. It will be up to the scientific committee to accept or refuse proposals. They will include: Name and surname, institution, e-mail address, title of proposal, summary of 250 words and a brief bibliographical reference. All proposals must be original and unpublished. NB: The Proceedings of the Colloquium will be published, according to the publishing standards which will be communicated later, in la Collection Etudes des Presses Universitaires de Perpignan, after a selection of texts by experts and reporters at the international level. * These fees cover participant’s kit, attendance certificate, coffees and lunches. * Accompanying persons will be subject to the same conditions as auditors. * Payment will be made in local currency FCFA—Ivory Coast currency—upon arrival to Mrs. Brou Angoran Adjoua Anasthasie. To obtain the “Attendance Certificate”, one must have attended at least 85 percent of all the total sessions. Duration of Exposés: each exposé will last 25 minutes (to be respected). Travel and accommodation: Each participant is responsible for the costs of travel and accommodation. Suggestions on how to get to Abidjan and standardized hotels with international norms will be provided. It is advisable to come with summer clothes. Visa: Once the registration to the Symposium is secured, you will receive a letter of invitation and addresses of the hotels for visa application—necessary to travel to Ivory Coast. You can get your Visa from Ivorian embassies and consulates (recommended) or at Abidjan airport. The processes for VISA can be found online at www.rdvvisas-ci.com. You do not need a visa if you are a citizen of ECOWAS or Central African Republic, Republic of Congo, Morocco, Mauritania, Seychelles, Singapore, Chad, Tunisia and Philippines. Currency: The CFA franc is the official currency of Côte d’Ivoire (1 EUR = 655.957 CFA / 1 USD = 596.449 CFA). Conversions of currency can be done at the airport, banks and hotels. Vaccines: at Abidjan airport it is required to present the international mandatory yellow fever vaccination book. Extra vaccines recommended are: Hepatitis A and Hepatitis B, Typhoid, Tetanus, Meningitis. Also, anticipate anti-malaria treatments.